Reference Pure Series drums use a combination of task specific bearing edges and 3 time proven woods: Birch, Maple, and African Mahogany. Using Maple as a sole material has long been the traditional choice for shells and for good reason. Maple provides smooth, well balanced tone that is perfect for a 12" tom. Subsequently, all Reference Series 12" toms are composed of 6 thin plies of Maple. The only single wood shell in the series. Our 10" and 8" toms receive 4 thin plies of Maple with 2 inner thin plies of Birch for cut and attack. And for maximum response, all 13" and smaller toms have a rounded 45° bearing edge. Beginning with our 13" tom and larger, Mahogany is added to the inner plies to increase the lower frequencies and accentuate the warmth of the Maple. The 14" toms and larger begin using our fully rounded bearing edge for even more shell contact. Our 18" and 20" bass drums use 4 inner thin plies of Mahogany with 2 outer thin plies of Maple. As the size of the bass drums increase, so does the amount of Mahogany. Our 22" and 24" bass drums incorporate an amazing 6 inner thin plies of Mahogany surrounded by 2 outer thin plies of Maple for the ultimate in solid responsive bass frequencies. Maple is a fine grain wood with a smooth even texture. This highly respected wood offers a very wide dynamic range with extremely well balanced acoustic properties. Rich lustrous lows, with an even balance of mid tones and high frequencies have made this the all around accepted premium shell material for years in the acoustic drum industry. This mix of creamy warm resonant mid to high frequencies, balanced with the propensity for powerful bass response, makes it the logical choice for our 12" toms, which also happens to be the only single wood shell in the series. A straight grained wood with a fine, even texture, Birch is known for its strength and resilience. It provides a lively interior springboard for sound waves, which in turn creates a noticeable increase in the higher frequencies. This makes it the perfect interior for smaller tom-toms. Birch’s tightly bound network of cells also promotes a perfect balance of mid-range frequencies, with a smooth transition from the lower register to middle register. The 8" and 10" toms incorporate 2 inner thin plies of Birch for cutting attack and high frequency presence. African Mahogany is a relatively "soft" hardwood that offers a dramatic boost in lower frequencies. This bass boost effect is most likely due to its loosely packed cellulose network, which creates a natural resonator effect in the lower frequencies. This predisposition for powerful lows makes it the logical choice for the interior of 13" and larger toms. 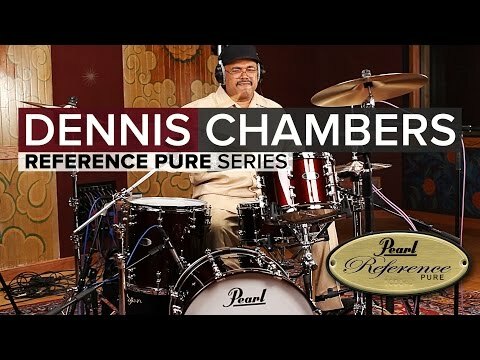 All Reference Series bass drums utilize 4 to 6 inner thin plies of Mahogany to produce a noticeably present bass response, as well as a naturally smooth sonic transition into the mid-range frequencies. The 45° bearing edge on Reference snare shells brings all 6 thin plies into play by promoting a tightly focused shell contact area for extreme sensitivity and maximum volume. The six inner thin plies of Birch provide a resilient crack, which is balanced and warmed by the 14 outer thin plies of Maple. The ultimate balance of power, projection and resonance, Reference Snare Drums are unlike anything you have ever experienced. The rounded 45° bearing edge featured on our 8" through 13" Toms offer cutting attack and projection, all balanced with a solid punch. This edge promotes a finely balanced interaction between the individual wood plies that allow the smaller toms to sing with amazing clarity, without premature delay. The journey of the energy from the head to the shell is given a much more direct path with the rounded edge. The fully rounded bearing edge provides the ultimate solid punch and resonance by raising the overall contact area of the head to the shell. This allows maximum kinetic energy transfer from the head to the shell, resulting in maximum shell resonance. This is the logic for using the fully rounded edge on 14" through 18" toms, for absolutely thunderous tom fills. Our 18" to 24" bass drums utilize also utilize this edge for a deep solid punch, creating sound pressure levels that are felt just as much as they are heard. Lower frequencies require greater energy to equal the projection of the higher frequencies, requiring the larger diameter drums to be thicker than the smaller drums. Reference drumsets feature two very different shell thicknesses: 6 thin plies on rack toms and 8 thin plies on bass drums and floor toms, for incredibly balanced sound. The Reference Snare Drum has an alarmingly thick 20-ply shell, giving it incredible projection and cut, perfect for higher volume musical settings. 2 inner plies of Birch are united with 4 outer thin plies of Maple to create an incredibly resonant shell. The 45 degree bearing edge brings all 6 thin plies to the party in a highly focused sweet spot. This projects the volume that you would expect from such a thin shell without losing sensitivity or articulation. The state-of-the-art in modern hardware adorns these snares to maximize every nuance of the shell construction. The 45 degree bearing edge on Reference snare shells brings all 6 thin plies into play by promoting a tightly focused shell contact area for extreme sensitivity and maximum volume. The 2 inner plies of Birch provide a resilient crack, which is balanced and warmed by the 4 outer thin plies of Maple. The ultimate balance of power, projection and resonance, Reference Snare Drums are unlike anything you have ever experienced. Pearl’s revolutionary BRL-65/55 lugs assure the ultimate in head seating and tuning integrity. The unique swivel function allows the tension rods to align perfectly into the lugs. This ensures that there is no pressure against the hoops, allowing for maximum resonance and sustain. Stainless Steel Tension Rods instill a level of confidence with their consistent and precisely milled exterior. All Reference Snare Drums feature Pearl’s SR-1000 Glide-Lock Strainer, which includes a locking throw off lever and tension knob that won’t loosen no matter how hard you play. Low-friction technology permits smooth gliding action for ultra quiet, super precise motion. The same tireless pursuit of perfection that goes into our legendary drums is found in our hardware. Hardware designed to maximize the sound of your drums. Pearl Hardware has set the standard for strength, durability and innovation. It’s the choice of working professionals who depend on their equipment. Surefooted on stage or in the studio, when the show must go on, count on Pearl hardware. Our bass drum claws incorporate rubber hoop isolators for scratch prevention on lacquered hoops, provide evenly distributed clamping force for consistent tuning. The key bolts are recessed for snag-free fit in carrying cases and to eliminate accidental detuning. Full height adjustment with our built in memory lock keeps floor tom positioning perfectly set. Our patented Air Suspension Rubber Tip allows your floor tom to rest on a cushion of air. These large rubber feet prevents premature sound decay from floor contact. Floor toms never had it so good. The OptiMount Suspension System provides tom mounting with zero shell contact for ultimate resonance. By attaching to the tension bolts via isolated rubber bushings the shell is allow to float which in turn allows it to sing to its fullest capabilities. Our telescoping spurs feature rubber or spike tips for maximum traction control. The high-grip rubber tip can be retracted to allow a recessed spike to be exposed for maximum “bite” on carpeted surfaces. Pearl’s stainless steel tension rods are machined from a single piece of stainless steel to the most exacting tolerances in the industry. They feature super smooth and precise tensioning with absolutely no play. Each is matched with a precision-machined brass swivel nut for ultra-precise performance.